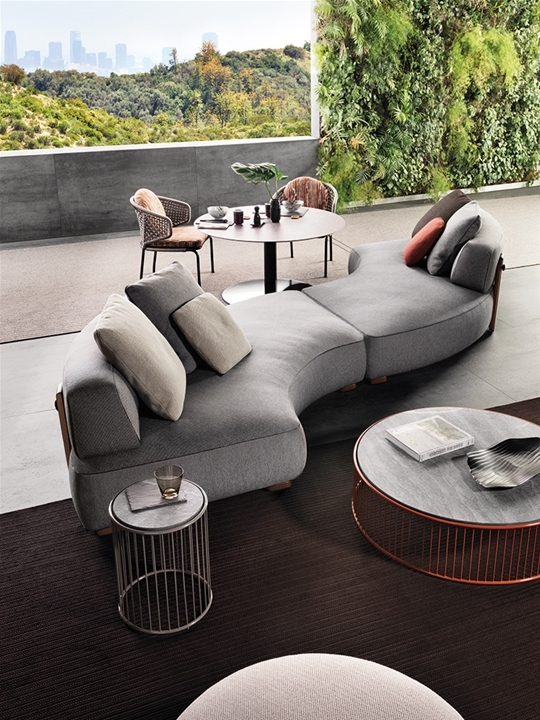 With the Florida seating system, the concept of a sofa entirely upholstered in fabric is expanded to include the outdoors. 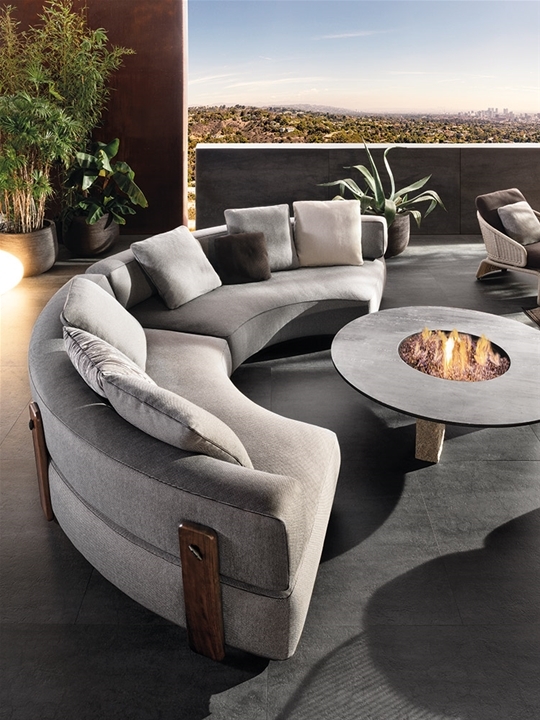 Florida is a formal clustering of soft, geometric shapes outlined in outdoor-friendly eco-leather piping, and comes in four colors – Light Grey, Dark Grey, Brown and Sand. 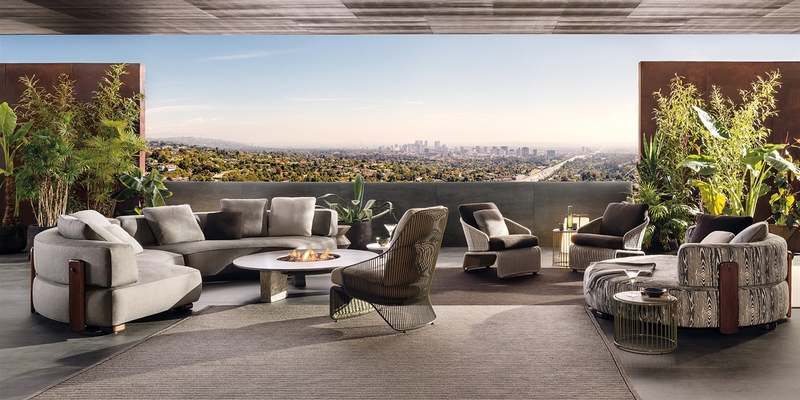 The variety of pieces available allows for the creation of multiple compositions that meet the increasingly widespread demand for spaces that are more intimate and cozy, as well as areas for social gatherings, even in outdoor settings. 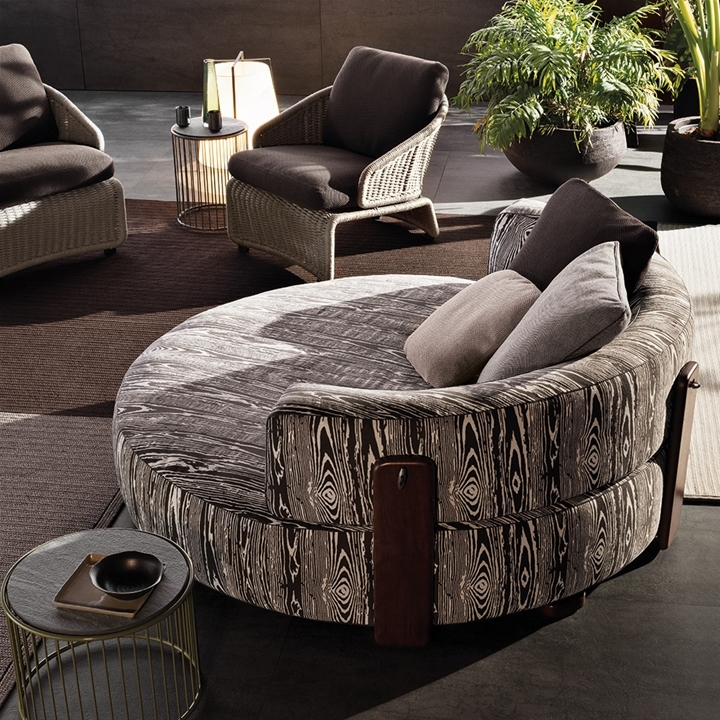 The easy-to-remove upholstery comes in an impressive array of outdoor fabrics in shades inspired by the colors of nature, as well as in more vivid hues. 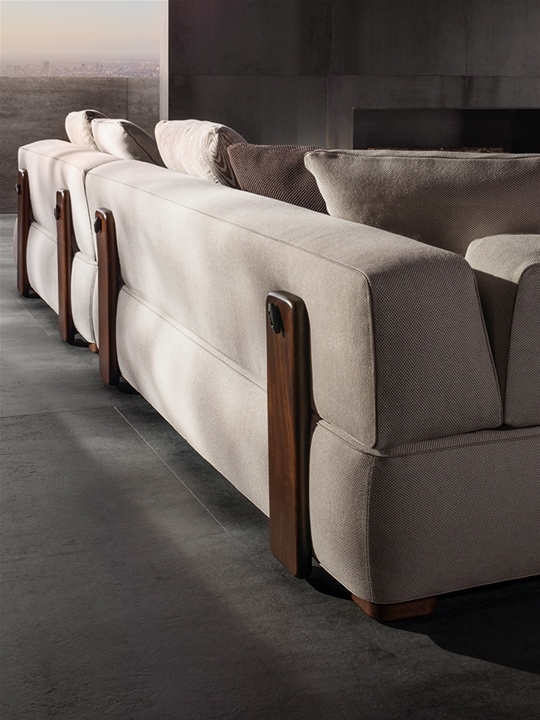 Equipped with a state-of-the-art adjustment system, the feet are made of prized solid natural Iroko wood, as are the rear supports that stabilize the padded backrest. 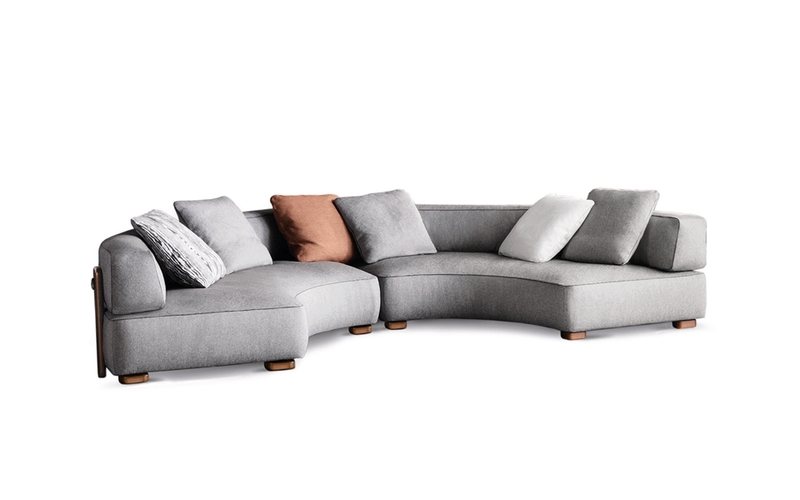 The backrest cushions are attached to the wood supports by elegant metal frogs with polished Pewter finish that allow the cushions to be quickly detached in order to remove the upholstery covers. Florida’s structure is in metal, suitably treated to make it especially resistant to corrosion, and coated in foam padding; it is then covered in water-resistant, weather-resistant fiber and fabric. 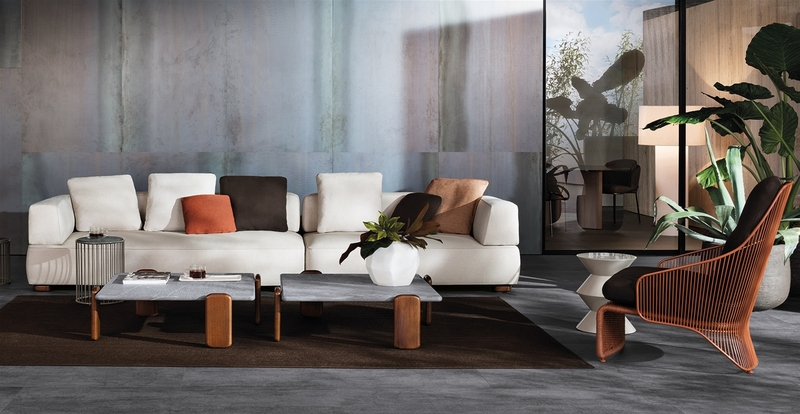 The Florida coffee table has solid, natural Iroko wood feet and the top, in Pietra del Cardoso stone, has contoured edges and a brushed finish. Thanks to its mineralogical composition, Pietra del Cardoso stone has a very compact structure and excellent properties of weather-resistance.